You've probably heard of "crowdfunding" sites, such as Kickstarter, Indiegogo and GoFundMe. Entrepreneurs can post their business ideas on such sites and solicit donations to help fund start-ups or product research and development. And some pro golfers have tried such generic crowdfunding websites. But wouldn't it be better if there was a site designed specifically for golfers? Now there is. It's called ProUKnow.com, and Natalie Sheary (above) and Michelle Shin (right) are two of the first golfers giving it a try. You might say Sheary and Shin will serve as test cases for the concept. A small percentage of aspiring pro golfers come out on tour backed by big-dollar sponsorship deals and great fanfare. That's not the case for most golfers, however, many of whom start on developmental tours and work their way up. They face travel expenses, lodging, food costs, caddie costs (if they can afford to pay a caddie at all), tournament entry fees. Expenses can run up to $75,000 a year just to try to establish yourself in the game. So ProUKnow.com, if it survives and thrives, can help golfers (both men and women) find the funds they need to chase the dream. As I write this, there are four golfers who've created crowdfunding campaigns on ProUKnow, including Sheary and Shin. It's appropriate that these two are going first on ProUKnow, since they are both Wake Forest grads. It works this way: You visit the player's page on ProUKnow and read their pitch. You can contribute any amount you want (starting with a minimum of $20), but there are also specific contribution levels that will get you rewards. Rewards range from t-shirts and custom hats to Bluetooth speakers or a golf lesson with the player you are supporting. (Rewards differ from golfer to golfer.) Companies can also get logos placed on a golfer's bag or golf shirts. But again, you don't have to contribute a large amount; any contribution is welcomed and appreciated. It was a pretty good birthday this year for Danielle Kang, who turned 22 just a few days ago. But because of her travel schedule - flying into China for this week's Blue Bay LPGA - her birthday stretched and stretched and stretched. But the biggest present for Danielle was still to come. It arrived on Thursday in the first round of the Blue Bay LPGA, a brand new event on the tour's schedule, played on Hainan Island, China. On the 17th hole, Kang holed out with an 8-iron on the 155-yard par-3. And that was the hole-in-one prize hole. The prize? A Buick LaCrosse luxury midsize sedan, MSRP starting at $33,535. "I was pretty pumped,” Kang told LPGA.com. “My caddie had to tell me to calm down." The ace was part of a first-round 68 that left her two strokes off the lead. Kang, it seems to me, is a player on the verge of a breakout on the LPGA Tour. She won back-to-back U.S. Women's Amateur Championships in 2010 and 2011, then turned pro at age 19. As a rookie in 2012, she had a best finish of a tie for third, and in 2013 a best finish of a tie for fifth. With no LPGA wins yet, Danielle is flying a bit under the radar. But she's been nothing but solid throughout her brief pro career. She was 52nd on the money list as a rookie and 57th in 2013. So far in 2014, Danielle has already tied her career high in cuts made (17), and is, again in the 50s on the money list. Her best finish so far is fifth place at the Canadian Open. Morgan Pressel is giving away two of her own stand bags this month, both autographed, and if you want one it's very easy to throw your name into the hat. October is Breast Cancer Awareness Month. As I'm sure you know, the fight against breast cancer is a very personal one for Morgan, who lost her mother to the disease at a young age. So Morgan has always used her celebrity to help raise awareness (and money). Her Morgan Pressel Foundation has raised around $2 million over the past several years, including around $600,000 this year alone. What does it do with money? Things that have very tangible benefits for women (and men): "Last year, with the monies raised, we were able to purchase the Kathryn Krickstein Pressel Mammovan in association with the Boca Raton Regional Hospital, which travels around the area providing easy access for a yearly mammogram." That's good stuff! But back to the golf bags: you want to know how to enter the contest, right? It's simple: Visit the Morgan Pressel Foundation Facebook page and like it. Step 2: Go to this post on the page, which explains the contest, and leave a comment explaining "how you will help raise awareness for breast cancer this month." That's it! Do those two things and you'll be entered. You must like the page and leave your comment by 11:59 p.m. on October 31, 2014 - that's the end of Breast Cancer Awareness Month and the deadline for entering the contest. Oh, and while you're there, share the post explaining the contest - Morgan is donating a dollar for every share. Any questions about the contest or donations? The foundation's email address is available on its Facebook About page. If you follow Carly - and you should - one thing becomes perfectly clear about her: She's a very happy young woman, leading the life she wants to live. You could certainly do a lot worse than to have Carly as your life coach. Entries for the contest are closed, so don't get any last-minute ideas for submissions. The last minute is already past. The contest was described this way by Marriott International Asia Pacific: "Courtyard by Marriott is looking for the next generation of entrepreneurs with big dreams and big ideas. We are calling for entries for those with a great business idea - be it an innovation, a product or a service. If you think you have what it takes, submit your idea before 28th September 2014 for chance to win 1 million rupees." A microsite about the contest on the India Times website explains that more than 1,000 submissions were received. Those are currently being whittled down to five finalists, and finally, one winner will be selected. The microsite prominently displays Nicollet's role in promoting the Young Entrepreneur Challenge, and says she is "currently the only Indian on the Ladies European Tour. Her sharp skills, bold personality and savvy style have helped her stay ahead of the game." "Bold personality" certainly suits Sharmila, as Golf Babes' Twitter followers would know. We've often retweeted her over the years. If you follow her (@MissNicollet) you'll frequently laugh and sometimes scratch your head, but never be bored. 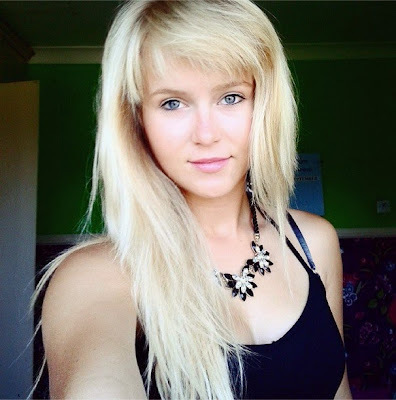 Unless you happen to be English, like she is, Ellie Goodall is probably a new name to you. But the first round of the LET Access Series' WPGA International Challenge just ended, as I write this, and Goodall - a 19-year-old amateur - shares the first-round lead. We don't know where Ellie will wind up in that tournament, of course, be we do know what she's done so far in her very young career. She was the English Northern Girls Champion in 2011 and 2012, and the Northern Ladies champion in 2013. (The Girls championship is a junior tournament, the Ladies championship an adult one.) She was also the Yorkshire Girls champion in 2013. 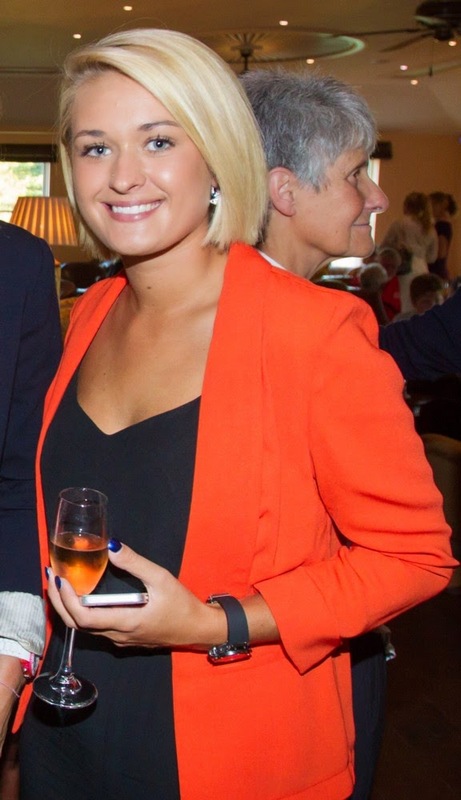 In a couple big amateur events so far in 2014, Goulding was 10th in the Scottish Ladies Open Championship in April, and 18th in the English Women's Open Amateur Stroke Play in August. Many (most) of the tournaments on the LPGA schedule throw gala welcome parties for the golfers. Which is great if you're a fan of golf babes, and the golfers who dress up for these parties enjoy using social media. 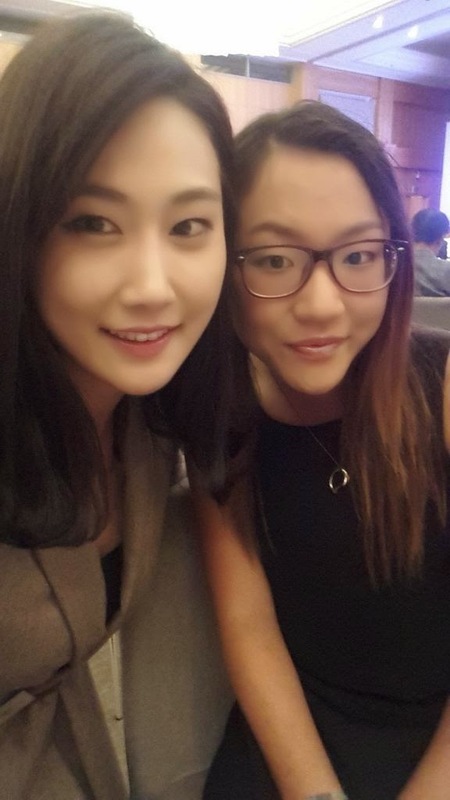 Below are some of the pics shared by LPGA golfers playing the 2015 LPGA KEB HanaBank Championship in Korea. 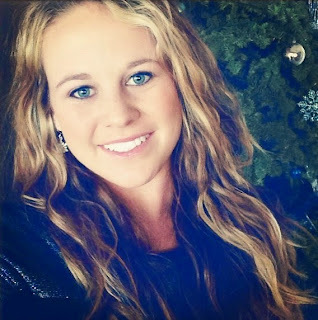 What does 2015 have in store for Kylee Duede? 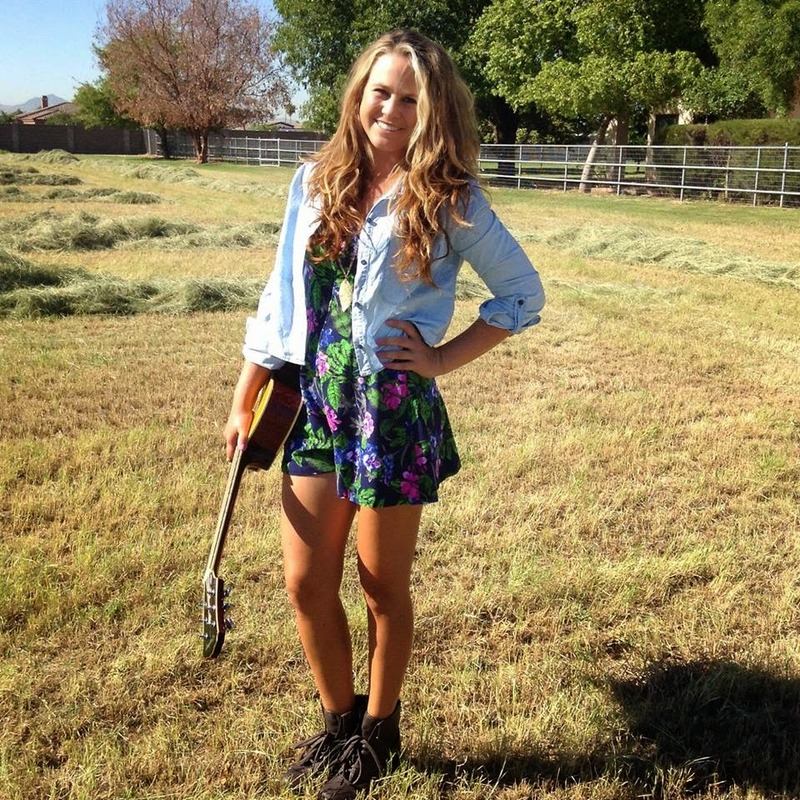 She plans on playing Cactus Tour tournaments in Arizona, along with some Symetra Tour events. And some of the state opens, depending on how the calendar falls. She'll be working toward Q-School attempts for both the LPGA and the Ladies European Tour. It helps to enjoy travel when you're a touring professional, and Kylee does. "I love traveling, so add golfing to the part and it couldn't be a better gig," she told Golf Babes. Duede has battled rheumatoid arthritis virtually her entire life, so staying in shape becomes even more important. "Fitness is a huge part of my success," she said. "Eating healthy and staying in tip-top shape helps me move better in my swing." The arthritis affects her left knee, and she likely faces a knee replacement at some point in the not-too-distant future. Kylee told the Arizona Republic newspaper earlier this year, "It worries me a little bit. That is why I want to do all the golf I can right now. If I can get 10 good years out of it, I'd be happy." In the same article, Kylee's instructor (Jack LoBiondo of Talking Stick Resort) called her "probably the most determined and hard-working student that I have ever coached." At this stage in her career, Duede is best known as one of the cast members on Big Break Florida, which aired earlier in 2014. She turned pro to take part in that experience. As an amateur, Kylee was a 2-time winner of the Arizona State Match Play championship, in 2011 and 2013, and was runner-up in the Arizona Women's State Amateur in 2013. Tessa Teachman has done something that not many golfers can claim: She's won high school state championships in two different states. Given that you have to be attending high school in a given state to play in that state's high school championship tournament, there aren't many golfers out there who've won in different states. But Tessa won the New York high school championship in 2004 and then the Louisiana state championship in 2007. Beginning Oct. 7, we'll get to watch Teachman as a cast member on Big Break Myrtle Beach; that's the date the new series begins airing on the Golf Channel. Teachman is one of six women, along with six men, who make up the cast. After high school Tessa played collegiately at Louisiana State University. 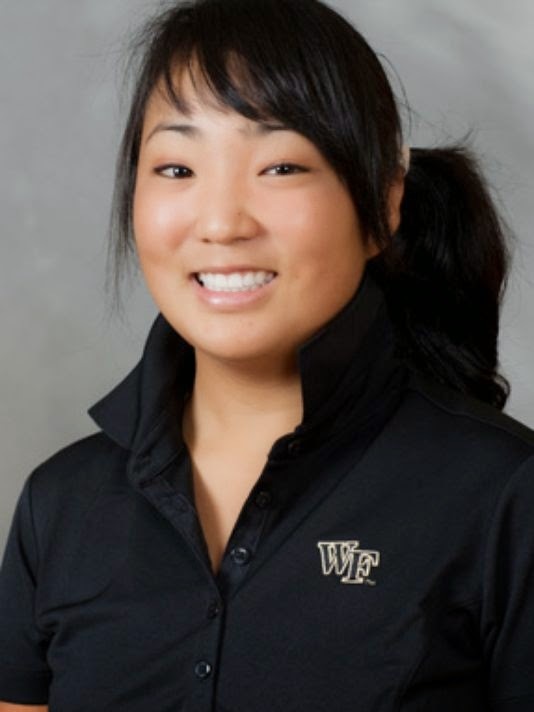 She made the National Golf Coaches Association All-Scholar team three consecutive years (2010-12). A wrist injury bothered her all four years in college, but she managed to finish third in the NCAA individual championship in 2012. She turned pro in 2013 and posted a victory on the Suncoast Series. In 2014 she has full status on the Ladies European Tour, earned with a 10th-place finish at Q-School. Despite that, Tessa has been able to play only two LET tournaments this year. Why? As for many young women golfers, sponsorship dollars are tough to come by, and with the higher expenses of travel to Europe for the LET, Tessa simply hasn't had the financial opportunities to play overseas much this year. Hopefully the exposure she'll get on Big Break Myrtle Beach will help change that. (And hopefully the same is true for the other cast members, too.) Any potential sponsors out there who'd like to touch base with Tessa can make initial contact via her Facebook page or on Twitter. Jean Chua is back home this week, in her hometown of Kuala Lumpur, Malaysia, to play in the Sime Darby LPGA Malaysia tournament. You can also spot Jean this month in the page of Men's Health Malaysia, frolicking on the beach as part of a photo shoot that accompanies an article about her. 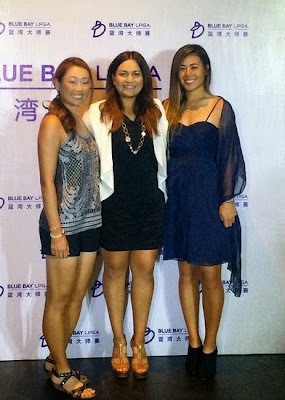 The article is headlined "The Trailblazing Angel," and is teased this way by the magazine: "We spent a day at the beach with Jean Chua, one of the Malaysian angels at the Sime Darby LPGA Malaysia Tournament this month. She opens up about dating and how you can measure up." 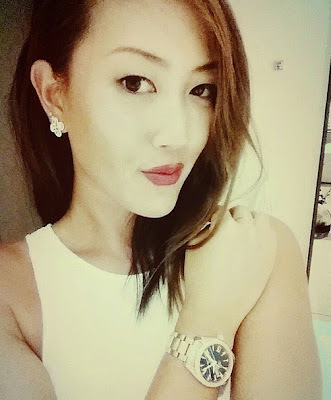 Some of the ways you can measure up if you want to date Jean are included in her Twitter bio: "LPGA golfer, born in Malaysia. Avid Fantasy Football Fan. Victoria Secret head to toe. Learning the ropes of hunting gators." Fantasy football, Victoria's Secret, gator hunting. And unexpected combo! (She's serious about the gator hunting, by the way.) An interest in ballroom dancing will also help your chances. How can you read the article and see more photos from the shoot? It's not online yet, but keep an eye on the Men's Health Malaysia website, and also the magazine's Twitter, Instagram and Facebook pages. Jean's first sport of choice was rythmic gymnastics, but she switched to golf in her early teens. She won the Hong Kong Amateur in 2003 and and the Asian Girls Junior Championship in 2004. She earned a scholarship to Wake Forest University and recorded once NCAA victory there. 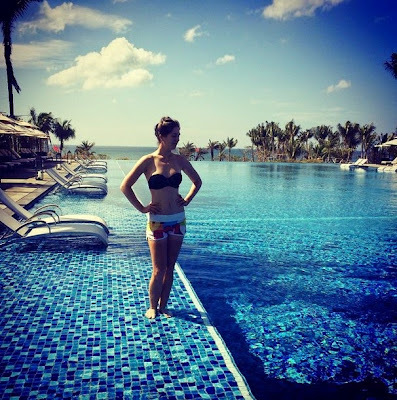 She turned pro in 2009 and won in her very first start as a pro at the Thai LPGA Open. In 2011, Jean first earned Symetra Tour status. She had excellent seasons in 2012 and 2013, finishing 15th and 25th, respectively, on the Symetra Tour money lists. Both seasons she recorded runner-up finishers, at the 2012 Riviera Nayarit Classic and at the 2013 Eagle Classic. 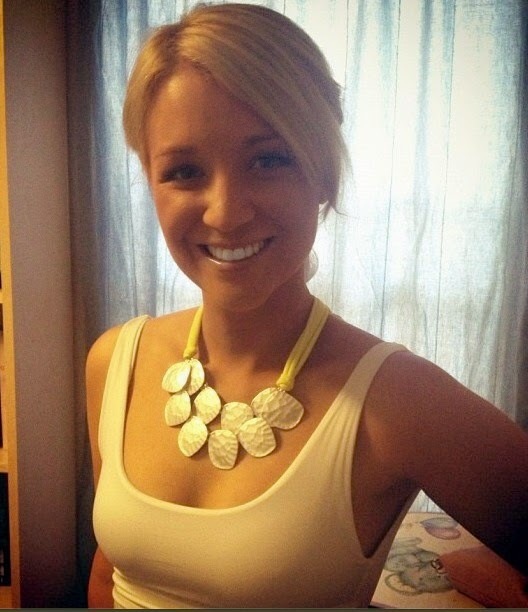 Annabel Rolley is a name and face Golf Channel viewers are about to become very familiar with. She's a golf instructor and television presenter, and she's the co-host of new show on Golf Channel. The show is called Lesson Tee Live and, beginning Oct. 8, it will air on Wednesdays at 8 p.m. (ET). Lesson Tee Live is - as you can probably guess from its name - a live instruction show. Some of the biggest names in golf instruction will appear on the show (David Leadbetter, Jim McLean, Bill Harmon, Craig Harmon and Bob Baldassari are among those already lined up), and viewers will be able to interact through social media and technology platforms. That's where Rolley comes in. As the co-host, Rolley is in charge of facilitating social media interaction between viewers and the instructors, working on Twitter, Facebook, Instagram, FaceTime and Skype. But Rolley isn't just a pretty face, although she certainly is that. 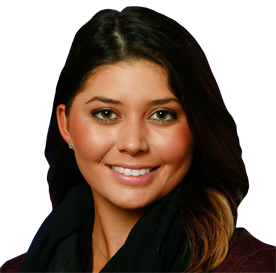 She has broadcasting chops honed in her native Australia, and is a PGA of Australia golf professional. She's also played in ALPG tournaments back home. Rolley also has some impressive club stops as a teaching pro: Royal Sydney Golf Club, Trump National Golf Club in New York, Royal Melbourne Golf Club and The Ridgewood Country Club in New Jersey among them. She's very good at her work, in other words. And beginning Oct. 8, you can benefit from her expertise, and that of her guests, on Lesson Tee Live. 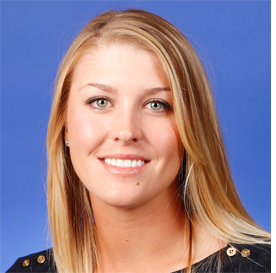 We know Sara Brown very well from her multiple Big Break appearances, including her participation in the recently concluded Big Break Invitational tournament. She's also played well on the Symetra Tour (including a victory) and Ladies European Tour, and held provisional status on the LPGA Tour. But now Sara is trying something new: She's the new cohost on the Golf Channel instructional series School of Golf. The gig lasts through the end of 2014; presumably Brown will head back out on tour in 2015. But regardless of her future golf plans, this is a huge opportunity for the personable Sara to forge a path to a post-competition career. That's not the only thing Sara will be doing on Golf Channel coming up. She's also the host of the Freddie Jacobson episode of Playing Lessons, which airs on Tuesday, Oct. 7. I expect her to do a great job. Be sure to tune in. Even if you don't care about the rest of the show, you'll enjoy watching Sara. Amy Boulden is having herself quite the rookie season on the Ladies European Tour in 2014. On the day this is being written, the 21-year-old golfer from Wales finished second at the Lacoste Ladies Open de France, one behind winner Azahara Munoz. Earlier in the season Boulden had a fourth-place finish. Then she had a third-place finish. Now she has a runner-up. Is win No. 1 just around the corner? Boulden's rookie LET season got off to a rough start with two missed cuts in her first three starts. But in nine starts since then she has missed only one cut; in the other eight events, her worst finish was 32nd. She has four Top 10s in those other eight starts, plus an 11th and a 20th. That's a very good stretch for a proven veteran; for a young, first-year player, it's fantastic. Boulden won the BBC's Young Sportwomen of the Year citation in 2008. She played on the European Junior Ryder Cup team in 2009 and Junior Solheim Cup team in 2010. She represented Great Britain & Ireland in the Vagliano Trophy in 2011 and 2013, and was on the GB&I Curtis Cup team in 2012. Amy won the Scottish Amateur in 2012 and the Welsh Amateur in 2013. And while still an amater she played her way into three Women's British Opens. 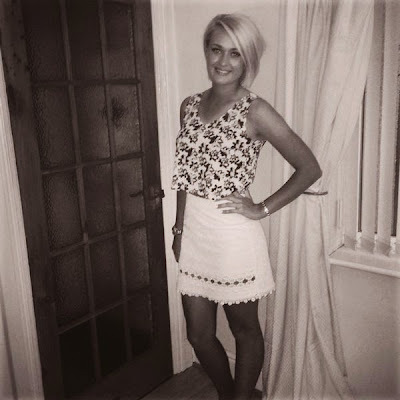 Amy turned pro late in 2013 and had a runner-up finish in an LET Access Series tournament. 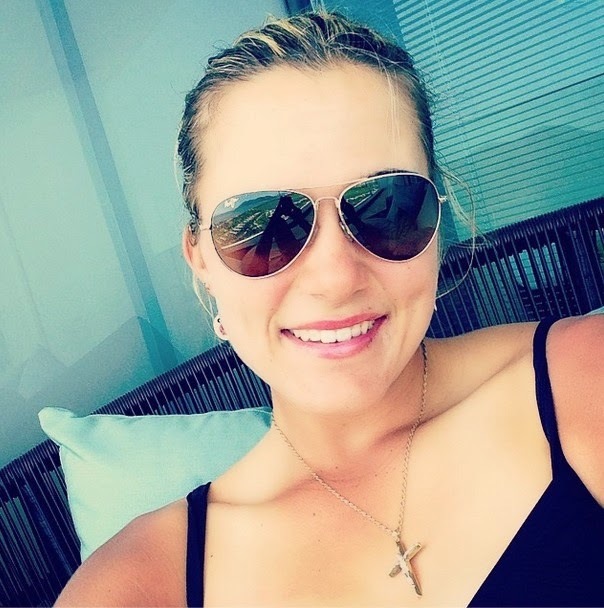 At LET Q-School she earned provisional status, then improved her status in the first re-rank in 2014 on the strength of her early season showings. Before her 2nd-place finish in the French Open Amy was 34th on the LET money list and in second place in the Rookie of the Year standings. The Big Break was my final tournament. I am retiring from golf to do full-time TV. I will miss it but excited for @18HolesJHanlin on Fox!! The Big Break she refers to in the tweet is the just-completed Big Break Invitational. At that event, Nolan made the cut but was eliminated on the next-to-last day in match play. Carling's first appearance on the Golf Channel show - her introduction to America - was on Big Break Sandals Resorts, the season for which she was the champion. She got into two tournaments as a result of that win, finishing 35th in the (no-cut) 2010 Lorena Ochoa Invitational on the LPGA Tour; and making the cut and finishing 22nd in the LET Omega Dubai Ladies Masters. 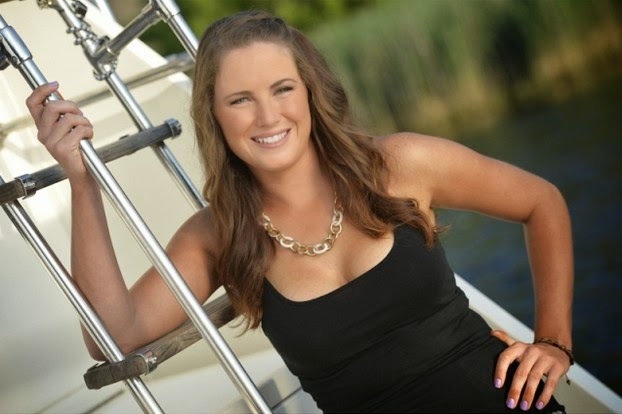 And Carling Monday qualified her way into an LPGA tournament just this year, but she mostly played in the years since Big Break on the Symetra Tour (formerly the Futures Tour). Her best career finish on the Symetra Tour was second place at the 2011 Titan Tires Challenge. Before turning pro, Nolan played college golf at Ohio State. Best wishes to Carling, and best of luck with her new career. 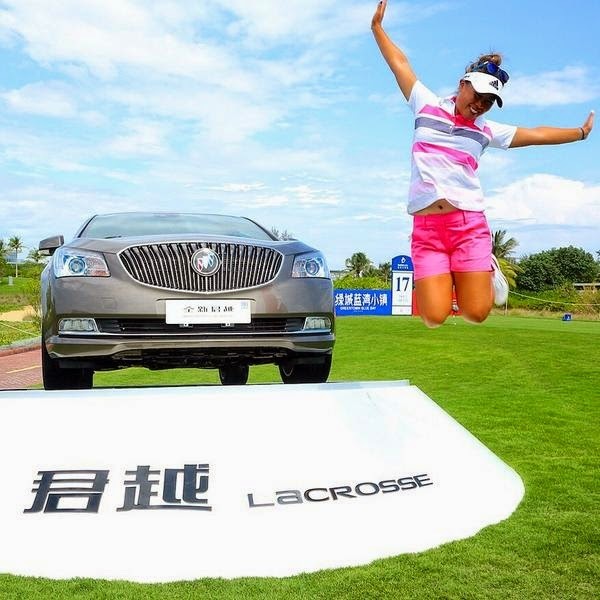 We like to occasionally highlight new sponsorship deals signed by women pro golfers because in women's golf - unless you're one of the biggest stars - coming by such deals can be a struggle. 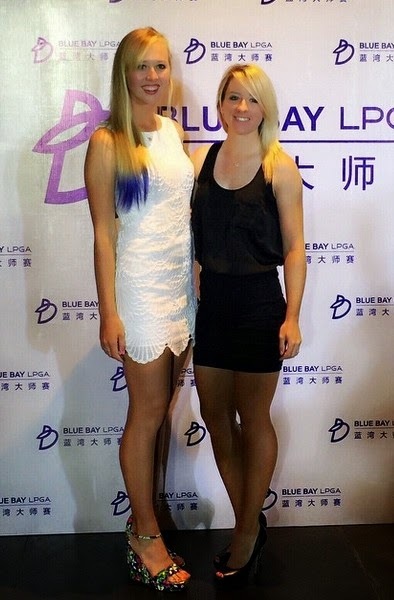 So here's some good news: a pair of LPGA youngsters have new deals with a company called Paylocity. Jennifer Kirby (left), in her rookie season, and Victoria Elizabeth (below), in her second year with LPGA status, now have Paylocity as a sponsor. Paylocity is a "cloud-based provider of payroll and human capital management software solutions" that is traded on the NASDAQ exchange. Kirby and Elizabeth join Brooks Koepka as pro golfers sponsored by Paylocity. "... It's their passion and dedication to improvement and future success that made them the obvious choices," Michael Haske, Senior Vice President of Sales and Marketing for Paylocity, said. "We wanted to find players who shared our commitment to innovation and growth." A native of Paris, Ontario, Kirby first caught the golf world's attention during her amateur career. In 2009, she became the first individual to win both the Royale Cup Canadian Women's Amateur and the Royale Cup Canadian Junior Girls Championship in the same year. Kirby then went on to attend the University of Alabama where she helped lead her team to a NCAA National Championship title in 2012 and was named a first-team SEC All-American. Kirby turned professional in May of 2013 and claimed her first professional victory in her first start at the CN Canadian Women's Tour Quebec. She earned her LPGA Tour card for the 2013-14 season with a fifth place finish at the LPGA Final Qualifying Tournament. Victoria Elizabeth began her LPGA Tour career in 2013, taking a different route to the top of women's golf. Before turning professional, the Dayton, Ohio native was a successful junior player with four victories on the AJGA, seven wins on the Future Collegians World Tour and was named the FCWT Player of the Year in 2007 and 2008. 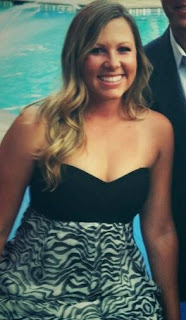 Elizabeth turned pro in 2009 and played on the Symetra Tour for four seasons. She had a breakthrough year on the Road to the LPGA in 2012 and recorded her first-career victory at the Credit Union Classic in Syracuse, N.Y. In addition to her win, she posted four top-10 finishes and ranked third on the Tour's money list. With a full season of LPGA Tour experience under her belt, Elizabeth is primed for future success. 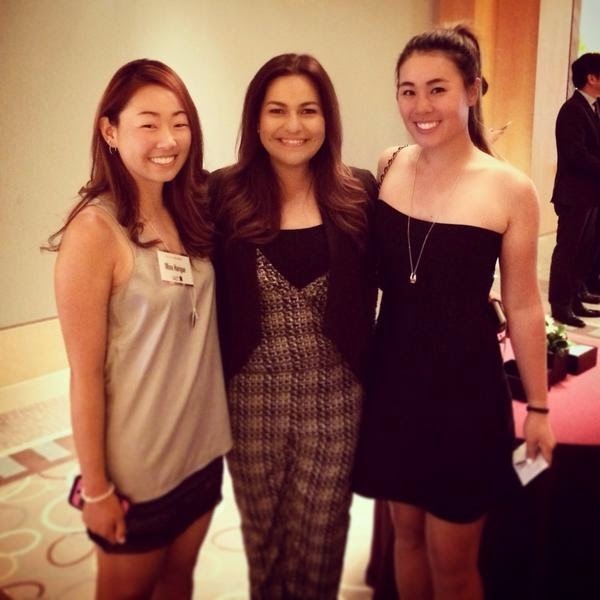 Thanks to Paylocity for helping support the young careers of two promising golfers.